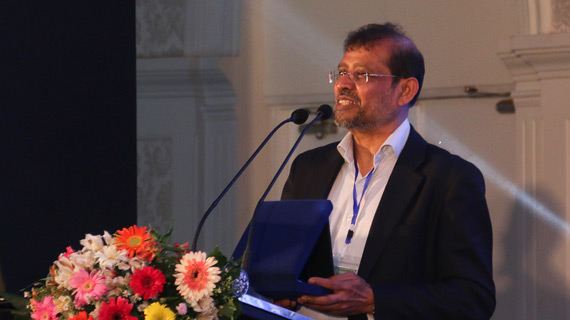 Dr Abhaya Induruwa, Director of the Centre for Cybercrime & Security Innovation (CCSI) recently delivered the keynote address at the Cyber Security Industry Forum organised by Sri Lanka Telecom in collaboration with the Sri Lanka CERT|CC (Computer Emergency Readiness Team| Coordination Centre). The theme of Abhaya’s address was the importance of National Capacity Building Initiative in Cybercrime Forensics, Cybersecurity and Cyber Intelligence in Sri Lanka. The event held at Hotel Hilton Residencies, Colombo, Sri Lanka was attended by more than 150 CIOs, CISOs, CEOs and other security industry personnel. This entry was posted in Events, Feature, Research and tagged 3CENTRE, Budapest Convention, CCSI, Centre for Cybercrime & Security Innovation, Cybercrime, Cybercrime & Cybersecurity Centre of Excellence in Teaching Research & Education, Dr Abhaya Induruwa, Internet, Sri Lanka on July 14, 2017 by ghcccu. This entry was posted in News and tagged CCCU, Dr Abhaya Induruwa, father of the internet, hall of fame, Internet, Sri Lanka on July 20, 2015 by admin.